Ushio, experts in semiconductor laser and LED technology, offer the HL40071MG 405nm single mode violet diode laser with 300mW output power. 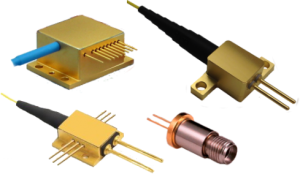 Packaged in a compact 5.6mm configuration this 405 nm laser diode is ideal for an OEM integration into a wide variety of applications including machine vision, fluorescence, and photoluminescence. The HL40071MG diode laser features a low threshold current and high slope efficiency resulting in a low operating current enhancing reliability.